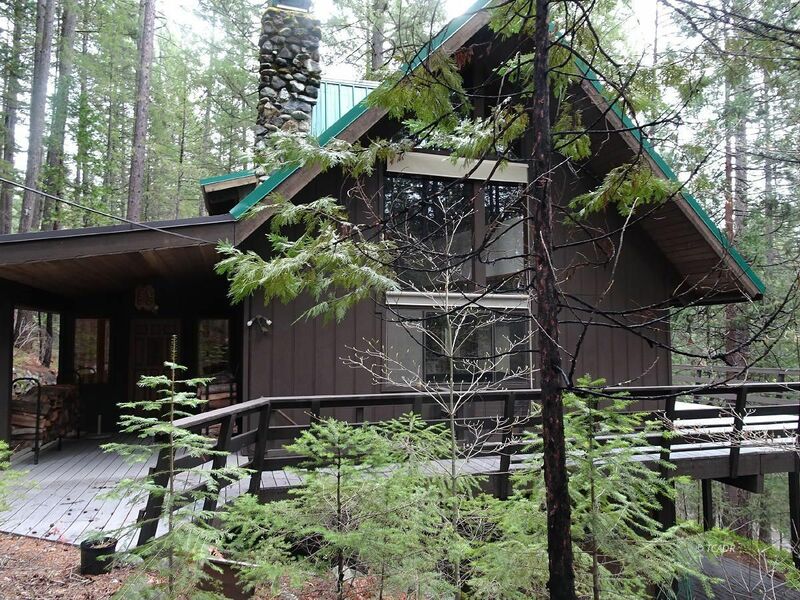 Charming chalet style mountain home located in a nice area known as Trinity Lake Knolls, about 1/2 miles from Trinity Lake. A large covered porch leads to the front door and beautiful entry way . The living room is welcoming with it's soaring ceiling and floor to ceiling windows that allow light beams to sparkle across the beautiful hardwood floors. Massive river rock fireplace with insert, built in bench with wood storage and multiple seating areas make the living room warm and inviting. Kitchen has beautiful maple cabinets with 2 lovely stained glass inserts, lazy-Susan turntables and a breakfast bar. Dining area features a slider leading to a huge three sided deck with forest views. Wonderfully large master bedroom has a sitting area, walk in closet and sliding glass door to the great outdoors. Both upstairs bedrooms have sliders to a shared balcony with views of the forest. The large loft with built in drawers and storage closet can accommodate multiple uses including exercise, yoga, sewing, hobbies, office or even extra sleeping area. The attached garage-shop has a wood stove, large storage area and laundry room w/storage room. Separate garage has storage above.